A Wall Street Journal oped on tax reform. This complements an earlier oped and see the tax link at right for many others. The bottom line: I argue for a national VAT instead of (and that is crucial) individual and corporate income taxes, estate taxes, and anything else. Why? I want to break out of our stale argument. "Lower taxes to boost the economy" vs. "you just want tax cuts for the rich." It's not going to go anywhere. I also want to break out of the process. Proposing cuts within the current structure of the tax code, even if proposing them with offsetting cuts in deductions, leads naturally right back to the mess we're in. Once you tax income much of the rest of the mess follows inexorably. If we go back to the beginning, and tax spending not income, so much mess vanishes. Once the government taxes income, it must tax corporate income or people would incorporate to avoid paying taxes. Yet the right corporate tax rate is zero. Every cent of corporate tax comes from people via higher prices, lower wages, or lower payments to shareholders. And a corporate tax produces an army of lawyers and lobbyists demanding exemptions. The estate tax can take close to half a marginal dollar of wealth. This creates a strong incentive to blow the family money on a round-the-world cruise, to spend lavishly on lawyers, or to invest inefficiently to avoid the tax. A reformed tax code should involve no deductions—including the holy trinity of mortgage interest, employer-provided health insurance, and charitable deductions. The interest groups for each of these deductions are strong. But if the government doesn’t tax income in the first place, these deductions vanish without a fight. Zero is important. Eliminating the personal income, corporate income and estate taxes is important. Taxes are like zombies. If you just reduce the rates but leave the taxes in the code, they come back. And all the deductions, exclusions, credits and the rest come back too. If we just compromise for a VAT in exchange for lower individual and corporate rates, we really will end up at European levels of taxes -- 20%+ VAT, 50% income tax, 20-40% payroll tax, 40%+ estate taxes. BTW, I should be clear what a VAT is. You pay the VAT, say 20%, on everything you buy. It's collected by the seller. You collect the same VAT on everything you sell, but you may deduct the VAT you have paid on your purchases. If I am in charge, period. Notice this gives people an incentive to collect the VAT. In this way, a VAT is, in fact, something of a corporate tax, and is largely "paid by" corporations. But it does not distort rates of return as much. More importantly, it is clearer, more transparent, and allows us to throw out the mess of the corporate tax code. The border-adjusted corporate tax reform was sold as a step towards a VAT, and it was -- if you have a PhD in economics to figure that out -- though it retains all the special deductions and carve outs of the corporate tax code. We need a tax that the average voter can understand, and a clean slate. 4) Redistribute income away from "the rich"
6) Arguments about the structure of the tax code are mixed up with arguments about tax rates, the overall level of taxes, the overall level of spending. Really, the current discussion is disheartening to an economist, who sees taxes as a necessary evil to raise revenue for the government, to be done with the lowest marginal rates and lowest distortions possible. The current discussion, entirely on the left and mostly on the right, sees taxes pretty much only as an instrument of redistribution to one or another class. Eliminating the income tax in favor of a uniform VAT, leaving the rate blank, lets us fix the structure of the tax code without getting sidetracked with all these other issues. What about progressivity and redistribution? The oped explains briefly how to make a VAT progressive, if that's what you want. The idea is explained more at length in an earlier post. Briefly, you get a rebate for VAT on your first $10,000 of expenditures, half on the next $10,000 and so on. The rebate can happen instantly, like a giant rewards program for debit cards. But it is becoming clearer to me that our redistribution system is just as chaotic as our tax system. A major observation: Why should every measure be assessed for its redistribution in isolation? For example, a major complaint on the left on the corporate income tax is the idea that corporate taxes end up being paid by shareholders, which are rich people, so it's redistributive. I don't think the fact is right -- corporate taxes are paid more by higher prices and lower wages, and we're all shareholders through our pension funds. But even if we admit the fact, that's a bloody inefficient way to achieve redistribution. The entire corporate tax, with all its shenanigans, exists to try to get more money out of shareholders? Just tax them directly! Get your redistribution elsewhere, and not this way. So, the thought touched on in the oped: We need at least a comprehensive measure of redistribution, and much more fine-grained than just across income categories. We could have a much flatter tax code if we had a more aggressive social welfare state, no? We should be able to trade these things off, getting better taxes and more effective redistribution, to people who really need the money. Both points are part of a more general point. We have become obsessed with income, both in taxation and in redistribution. America is becoming a class society with class defined by income. So many social programs treat income the way India used to treat caste. But income is a terrible measure, with little economic meaning. My mid 20's children are "low income." Consumption is a far better measure. And in terms of who deserves taxpayer funded help, we can think of a hundred characteristics that matter -- disability status, say -- much more than income. The income tax and vast amount of redistribution that happens on income alone is reinforcing this. Tax people by what they spend. Related, a standard objection to the VAT is that it is "regressive." Poor people spend a larger fraction of their incomes, so in a flat VAT they will pay more of their income in tax. First, I answer that with the progressive VAT. But more deeply, why should progressivity be measured as a fraction of income which has little economic meaning, rather than as a fraction of consumption in the first place? If I leave my income invested for others to use it to build factories, why tax that? Yes, I will be richer in the future, and we will tax that when and if I spend it. If I never spend it... well, good for me. Annual income is just not a particularly useful economic concept. There are lots of other almost as good ways to implement a consumption tax. The Hall-Rabushka Flat Tax is one, various proposals to implement a progressive consumption tax via the current income tax mechanism is another. My VAT shares a lot with the Fair Tax proposal to replace the income tax with a national sales tax. But reflecting on it, I like the finality of not even measuring income any more. Remember the zombies. And a VAT works better than a sales tax. However, the VAT is not a pure consumption tax, and I'm not persuaded it needs to be. (The title is a bit misleading, but I don't get to pick oped titles.) I would tax investment goods at the same rate as consumption goods. If not, then a lot of shenanigans will erupt trying to define what's an investment good and what is a consumption good. Is the corporate Ferrari a "investment?" A real corporate investment, like real corporate purchases of VAT taxed inputs, will yield profitable goods, and the VAT paid on investment can be deducted on the sale of those goods. Yes, it will be a few years later, but if the investment is worthwhile the profits should be larger if they come later. Yes, it's not as pure, but it's close -- we avoid the chaotic capital taxation of today, and we avoid trying to make a distinction between investment goods and consumption goods. Everyone pays the VAT. Everyone. Please don't bother to comment that we can't have a VAT because the politicians will just add back the income tax. I know the argument. If our country cannot legislate "we put in a VAT, we eliminate the income tax, and that's it," then democracy is doomed already. As usual, full text in 30 days, or get creative with your Googling. Wouldn't a large VAT amount to a double tax on savings that was accumulated before switching over? You paid income tax on the money before you dropped it into savings, now you get to pay VAT when you take it out to spend it. If we can agree to the VAT and no other taxes, we can start working out on transitions. In general I think we let too many great ideas go to waste because we fight about transitions. I'll take the double tax hit if I can never fill out a tax form again! There have been a number of recent papers arguing that market power has increased in the last few decades. Paul Krugman and others have argued that in the presence of market power (say, monopolistic competition), corporate taxes make sense because they are in part a tax on rents. Of course, addressing market power directly might be the best policy - but breaking up monopolistic companies might have large downsides in practice; it's probably a better idea to tax google than to break them up. Do you think that this is a reasonable argument? I think it is insane -- or reflects a case of here is a new question to which I will offer the same old answer -- to jump on the latest working paper and advocate policy. The monopoly question will be dissected. Its source will be dissected -- whether market forces or monopoly from excess regulation. Let us wait until the papers are at least published before jumping to "fix" the latest "problem." I was curious when Mark Blythn mentioned something similar to this in a video. He argued that the corporate tax would only apply if the company doesn't spend the money to raise wages or hire more workers. "Every cent of corporate tax comes from people via higher prices, lower wages, or lower payments to shareholders." This is really only true in a econ-fantasy world with infinite time horizons and ignoring the power of tax-free compounding. Specifically, if you have a 0% corporate income tax then corporate balance sheets become a form of tax shelter. Shareholders will pressure companies to retain all earnings rather than dividend anything so the money can compound tax free. This causes its own distortions as capital is not redeployed to new ventures but instead stays on giant corporate balance sheets invested back into the market. Did you miss the part about the VAT? The $10,000 item can be viewed as a bundle of 100 items at $100 each. "If our country cannot legislate "we put in a VAT, we eliminate the income tax, and that's it," then democracy is doomed already." OK. Its doomed. The Democrat Party is absolutely addicted to the mantra of "tax cuts for the rich". Republicans are terrified of winding up with both a VAT and an income tax. Incidentally, because it is now clear that the rich mostly support the Democrats, I have come around to the view that we should not give them any tax cuts. Indeed, I want to see the top rate increased to 50%. Abolish the SaLT deduction and limit mortgage deduction to houses worth less than $500,000. Please expand on the "tax investment goods" part eventually. Without it the "incorporate to avoid taxes" argument applies to your VAT-only scenario as well. Why is consumption a good measure to determine the capability to pay taxes ? It's a great proposal. But what would be the rate for a VAT tax? Are we talking 10 percent of all purchases? Five percent? Do you have any idea? And will the VAT be transparent so that each purchase stipulates the VAT tax amount? If it's hidden, the politicians will LOVE it. I am opposed to anything and everything the politicians love. Here's a back-of-the-envelope calculation. NZ has a GST (essentially John's VAT, without any progressivity or exemptions) of 17.5%. That raises 24% of government tax revenue, compared with 61% raised by individual and corporate income taxes (the rest comes from excise duties, foreign withholding taxes etc). So assuming (heroically) no reduction in consumption, the GST rate would have to rise to 44% to leave tax revenue unchanged. The income tax raises about 1.7 trillion dollars. The corporate tax portion is about $0.3 trillion and the income tax is $1.4 trillion. A VAT is based on production of goods and services so I use GDP as a measure of tax revenues. The GDP is approximately $18.5 trillion, so your percentage is off. I agree with a VAT and with the idea of refunding to offset regressivity concerns for the poor. Without an income tax, the pure VAT rate would be about 11% VAT, not 40%. The rich will consume more and will pay a greater share of the VAT revenue. The concept of progressivity based upon relative receipts from consumption reflects a reasonable approach. I also agree for one rate VAT for simplicity. Make the VAT the revenue producer and then Congress can spend the money to offset negative effects perceived of the VAT. The notion of taxing income is fundamentally bizarre. Why would you tax something you want more of? I think we would be better off with less consumption so tax that. People are concerned about carbon footprints...well, this addresses that. We would be better off with more investment and less consumption. We don't really affect each other when we make more income but we do affect each other when we consume more. Extravagant consumption raises prices for us all and consumes resources. As for progressiveness...people argue that the poor spend all their money on food, housing, and medical care. So exempt that from the VAT and you have a progressive tax structure. One person's consumption is another person's income. That's an accounting identity. Reducing consumption reduces income (excepting income that comes from asset price appreciation). Yes, but the economy would eventually adjust to lower consumption. It should be replaced by higher private investment and government spending. A lot of countries have lower consumption shares of GDP than we do and they are doing fine. I say go to a simple national sales tax (perhaps excluding food and medical) and big tariffs. Why big tariffs? In the US we have ubiquitous property zoning, embraced by leftie-loonies and the propertied-financial class. We will always have property zoning. Banks are heavily exposed to real estate, and that means zoned real estate. Undo zoning and go to free markets? Let's change the topic! But nations that run current account trade deficits tend to have exploding house prices. Foreign capital pours into real estate. And the supply of real estate is restricted. This problem is crushing in places like Hong Kong, getting worse by the day in Australia, New Zealand and Canada, and an indirect cause of the Brexit in Great Britain. Free trade is not leading to higher living standards if house prices explode. It is getting worse in key cities of the US. So eliminate the income tax, slap on the tariffs and national sales tax. I guess we have to keep Social Security funded as it is, which is too bad. Helicopter drops into the Social Security trust fund could perhaps lighten the load on employers and employees, who are probably the last people in the world we should tax. So who wrote the 74,608-page-long federal tax code? Gee, I suspect it was not the clerks at Wal-Mart. Most likely sophisticated tax lawyers, who were billing top dollar. That leads me to suspect this code will never be forsaken. And who would this tax code favor? How about progressivity by giving a cash allowance to everyone resident? It would give the option to over time implement some form of UBI if it is found to be effective and worth ramping up to the required levels. Rhetorical question: what utility function are you trying to maximize? John, could you offer an elementary explanation of how a true VAT would operate in practice, essentially eliminating Section 401 of the IRC? Thx. I had to look it up. "Section 401.—Qualified Pension, Profit-sharing, and Stock Bonus Plans" Yes. It joins the bonfire. No income tax, no need to shelter income from tax. Thx. In practice, how would this work for a retiree with a 5MM portfolio, which produces 100K of income (cap gains, dividends, interest and profits); this person also lives off of social security. So long as this money is kept in savings and not spent on "consumption," it is not taxable, correct? In other words, the minute you touch the principal to make a purchase, that amount is added back to your taxable income? Thx. Nevermind, I read this post too quickly. You are calling for a national sales tax, in essence. John, could you provide examples of countries which have eliminated income tax for a flat VAT? How successful was this change and did it achieve the policy objectives? Lots of countries have added the VAT to income and payroll taxes. Europe for example. It has proved a great revenue raiser, which means it's pretty non-distorting, and for that reason is opposed by people who think the best way to cut spending is to starve the government of revenue. Also the european VAT is far from simple and clean. I know of no country that has abandoned income tax in favor of a simple VAT. Since when must the united states wait for some other country to lead the way? John 1776, can you provide examples of countries with stable democracies? Don´t forget Argentina. We have 21% VAT, payroll taxes are 17% for the employer and 14% for the employee (not counting the part that goes to medical insurance). Then you get to pay income taxes at 35%. On top of that we have taxes on fuel and energy that are higher than in the US, import tariffs that make it worth your time and money to fly to Miami to buy a computer, property taxes at the local level and wealth taxes at the national level. If that is not enough of a mess local governments collect gross income taxes (like VAT but without the credit part) and the national government collects a 0,6% tax on credits and debits of bank accounts (1,2% total). Since all of this is not enough we have a fiscal deficit and some geniuses think that the solution is to increase taxes. I did this in Canada and you wouldn't believe what a stitstorm it was. Every party that has ever passed a VAT has lost the next eleciton. In fact it permanently destoryed the Progressive Conservative party in Canada, which no longer exists. A VAT is essentially political suicide and for what? The best tax policy is a policy that never changes. That way taxpayers and corporations can plan for the future. The cost of fiddling with the code is much higher than any theoretical benefits. Good article, but I disagree on two points. First, charitable orgs are far more efficient than government; contributions should be above the line deductions and government handouts should be cut. I like a vat, but I'm afraid we'd have that in addition to, rather than instead of, other taxes. Not all charitable orgs are more efficient. There is vast chicanery going on. And if you want to subsidize like the red cross, do it on budget rather than via tax deductions. Send them checks. If you like the VAT why in addition to much more inefficient, corrupt, and complex taxes? Just to hide the full rate from the electorate? Brian brings up an excellent point - what are the political benefits to introducing a VAT? 1. In my mind a progressive VAT tax (either progressive based upon total consumption or progressive based upon total income) is a non-starter. All that would do is push people / companies to do all of their consumption at the end of the tax year. End of tax year rebates amount to interest free loans to the federal government so why wouldn't people / companies simply forestall their consumption until close to the end of the tax year? 2. You are assuming that for a corporation, raw materials / intermediate goods purchased today will be incorporated into goods that will be sold in less than a year. In that case a company over the tax year pays a net VAT equal to the difference in the cost of raw materials / intermediate goods versus the sale price of the finished goods. But what happens if those finished goods are not sold for more than a year? Should a company be able to realize a negative VAT tax liability under these situations? Where does the money come from to compensate companies with negative tax liability? Come on Frank, these aren't that hard. I give you 10 pages compared to the current code 10,000, and 5 tax lawyers compared the the current millions and let's see if you can't work these out on your own. Neither is insurmountable -- nor a reasonable excuse to keep the current mess. "Come on Frank, these aren't that hard. I give you 10 pages compared to the current code 10,000, and 5 tax lawyers compared the the current millions..."
You are arguing for a simpler tax code here (which I whole heartedly agree with), not a VAT. A VAT does not address the central problem of Congress (and it's lobbyist cohorts) making regular changes to the tax code. Congress can make changes to a VAT just as easily as it can to an income tax code. That being said, tax policy should be adjusted in response to the level of economic activity in the same way that monetary policy is adjusted - by a group that maintains a level of independence from political influence. "...let's see if you can't work these out on your own. Neither is insurmountable"
Actually, I believe I listed three concerns - political feasibility, consumption shifting to the end of year under a progressive VAT, and negative tax liability under a VAT system. The first issue (political feasibility) was actually brought up by Brian Mulroney. How many U. S. politicians have successfully been elected to the Senate / House running on your platform? I already know of possible solutions to the other two, but you are the one pushing this system, so I would like to know your recommendations. The issue of negative tax liabilities is a bit tougher. On the one hand you want companies to be able to deduct the VAT tax they are paying on raw materials / intermediate goods that they purchase, even if that purchase occurs in a tax year prior to when they sell their finished goods. On the other hand, you don't want to create the perverse incentive for companies to pull finished goods off the store shelves near the end of the tax year in an effort to minimize tax liability. The supply siders have been saying that progressive taxation creates a disincentive to work / produce. I agree. Negative tax liabilities through a VAT have the potential to cause a similar problem - inefficient supply chain management. I buy $10,000 of raw material at the beginning of the year. With a 20% VAT, I now have a negative tax liability of $2,000. I turn that $10,000 of raw material and $10,000 of labor into goods that I can sell. Option #1 - Sell all of the goods for $30,000 ($10,000 = 50% pretax margin), pay net VAT of 20% x ($30,000 - $10,000) - $2,000 = $2,000, and realize an aftertax margin of ($10,000 - $2,000) / $30,000 = 26.6%. Option #2 - Sell 2/3 of the goods for $20,000 (same 50% pretax margin), pay net VAT of 20% x ($20,000 - $10,000) - $2,000 = $0, and realize an aftertax margin of ($10,000 - $0) / $20,000 = 50%. Obviously, finished goods can't sit on shelves forever - they will eventually depreciate / wear out / go out of style, but I think my example clearly illustrates a potential problem with VAT and negative tax liabilities. Option #2 - Sell 2/3 of the goods for $20,000 (same 50% pretax margin), pay net VAT of 20% x ($20,000 - $10,000) - $2,000 = $0, and realize an aftertax margin of ($6,666 - $0) / $20,000 = 33%. Obviously I am paying the full $20,000 for the labor and material and selling my goods for $20,000, so my effective margin is $0 (0%). But I still have 1/3 of the goods that I produced sitting on my shelves which is where my 33% aftertax margin appears. As long as my finished goods don't depreciate by more than 6-7% per year, I am better off holding onto them under option #2 and realizing the higher after tax margin. In Canada with the GST/HST - you file based on taxes you have collected or have as part of an outstanding receivable; you claim credits for taxes you have paid or owe on your accounts payable; if a receivable gets written off you claim a credit for the GST/HST you had previously reported; you pay (or receive) the difference; if your business has revenue less than $1.5Million per year you only have to file once per year but can file more often; if your revenue is $1.5-6.0 Million you have to file at least quarterly; if you have revenue over $1Million then you have to file monthly. Short answer to Frank - you can claim the input tax credit immediately, you do not wait until the underlying product is sold. Claiming unusual looking refunds is an invitation to be audited by the Canada Revenue Agency and people have gone to jail for false refund claims. It was a mistake (but politically popular) to reduce the GST from 7% to 5%. What is the rationale behind tying the number of times a company must file a tax return (annual for revenue less than $1.5 million, quarterly for revenue between $1.5 and $6 million, monthly for revenue over $6 million)? Also, you mention that the GST/HST was reduced from 7% to 5%. How were negative tax liabilities that had not been realized treated when the tax rate was changed? For instance, I bought $100,000 of intermediate goods last year generating a negative tax liability of $7,000.00 that I have not realized yet. Now that the VAT has changed to 5%, does my negative tax liability change to $5,000 based on the new rate or does it remain unchanged at $7,000? Filing a GST return has an administrative cost for the business and the government. Concern over that cost was a political talking point opposing the introduction of the tax. By allowing smaller businesses to file less frequently it makes the administrative burden more proportionate for the tax payer and the government to the amount of net tax involved. Less frequent filing also eases cash flow burdens on the company filing. It went from 7% to 6% to 5%. Basically your credits were based on when the tax became payable to your supplier. Absent attempts to game the system, the applicable rate is the rate in effect on the date of the invoice. Every invoice has to breakout the GST/HST and give the tax filing number of the company sending the invoice. If you claim an input credit on your filing there is the possibility that Canada Revenue will go and check with your supplier to see whether you were charged that amount or not. In your example, the credit would remain at the $7,000. Are input tax credits transferrable and has a secondary market developed for transferrable input tax credits? Meaning, I am a producer of finished goods with a long time between when I buy raw materials and when I sell my finished goods (multiple years). Rather than holding onto my input tax credits until my goods are finished, I want to sell those tax credits for cash immediately. "What about progressivity and redistribution? The oped explains briefly how to make a VAT progressive, if that's what you want. The idea is explained more at length in an earlier post. Briefly, you get a rebate for VAT on your first $10,000 of expenditures, half on the next $10,000 and so on. The rebate can happen instantly, like a giant rewards program for debit cards." With this, it makes a little more sense. With instantaneous rebates and progressiveness based upon the total amount consumed over the year (not the end of year income), there is no longer the incentive to delay purchases until the end of the year. However, this solution introduces some book keeping elements. Who keeps track of accumulated purchases by the individual? Right now, I walk into a store and buy groceries with cash without the cashier knowing my name or anything about me. With a progressive VAT, am I now submitting my name, social security number, and my complete annual purchase history to the cashier so that I get the correct instantaneous VAT tax rebate? If you want to use cash, and you're under 10k per year, you gotta save the receipts and send them to the IRS. Otherwise, get a debit card. The bank reports your VAT payments - not your purchases -- to the IRS. The IRS then checks if you're under 10k for the year, and authorizes the rebate. If you don't like reporting stuff to the government, well neither do I, but you no longer need to report where you made money, and if you really want to hide it, well, don't apply for the rebates. I.e., when you sign up for a credit card, there is a box to check, "do you want us to report your VAT payments to the IRS, and distribute rebates, with this card." You can check yes on some cards and no on others. "The bank reports your VAT payments - not your purchases -- to the IRS. The IRS then checks if you're under 10k for the year, and authorizes the rebate." Huh??? The bank reports your VAT payments (not purchases) to the IRS. How does the IRS know if you are under $10,000 in purchases for the year if banks aren't reporting purchase amounts to them? And suppose you use a mix of cash purchases and debit card payments over the year. The bank / IRS will not have a complete transaction history. Sorry, not clear. I was trying to preserve some civil liberties. (Though this is only needed at all if we want to make the VAT progressive, rather than the better idea, which is to do redistribution separately.) If the VAT is uniform, say 20%, then the VAT paid is 20% of purchases and you don't have to separately report. But the IRS would probably want to know what you bought to guard against cheating. Cash you send in receipts. If you got all of your rebates already via your debit card, sorry, no rebate. Okay. That is what I thought you meant. Meaning, as long as you have the receipts to prove it, you can cash in rebates at any time in the future (a year from now, five years from now, etc.). Obviously, it would make little sense for a consumer to hold off cashing in rebates. But for a company / individual that both pays and collects VAT, continuous time balancing of VAT payments and VAT collections may not be possible. During a recession, a company will have paid VAT taxes on raw materials / intermediate goods but will have unsold finished goods on the shelves. Does that company also have an asset on it's balance sheet in terms of an unrealized VAT rebate? Companies don't get VAT rebate. This is a way to make VAT progressive for individuals. They get to deduct VAT paid on their inputs from VAT collected on their sales, a different issue. Does a company have an asset on it's balance sheet in terms of an unrealized VAT deduction? In the Canadian GST example, input tax credits have absolutely no relationship to when the finished good is sold. You file the ITC when you receive the invoice from your supplier with the GST on it, and you charge GST when a taxable sale is made. There's no attempt to match the two. This does mean that company could have a negative GST liability in any given filing period, but this negative liability should be offset by someone else's payments. In other words, if I'm filing for a GST refund, it should be because my supplier charged me GST and is remitting it. Depending upon your business model, you could have a GST refund every single filing period -- for example, if you buy goods for export -- but the country shouldn't really be wearing much float from it. These refunds may not be perfectly offset by government collections all the time due to differences in filing periods, but in a nation full of GST receipts it's not a killer. I'm not aware of a secondary market for ITCs because there's no need for one. ITCs expire after a certain amount of time. I think it's two or four years depending upon the size of the business. As a practical matter, this shouldn't be that significant, because getting that refund sooner is almost certainly better than trying to hold on to it for some reason. From the accounting standpoint, every company in a refund position should have an asset on their balance sheet for unclaimed credits. This is because they've already paid their supplier for it (or more accurately, coded the invoice for payment to the supplier). Typically you would record liabilities for GST collected, assets for GST paid, and the net of the two would equal your payment or refund for a given period. I have much less exposure to VAT in the EU, but from what I've experienced the broad strokes of it are very similar. "ITCs expire after a certain amount of time. I think it's two or four years depending upon the size of the business. As a practical matter, this shouldn't be that significant, because getting that refund sooner is almost certainly better than trying to hold on to it for some reason." First, as I describe below, some countries (like Japan) don't use the invoice based method for a VAT, they use an accounts based method instead. Second, getting that refund sooner may be beneficial to the owner of the IST, however, it may be beneficial to the government (Canadian or otherwise) if people / companies held onto ITC's rather than cashing them in immediately. A government could conceivably finance it's deficits or reduce it's outstanding debt obligations with the use of ITC's that are held by the public. As I said below, even the Japanese system does not seem to match ITCs with the sale of a specific finished goods. It sounds to me that the difference between the Japanese system is that it doesn't require the VAT to actually be charged on every invoice. Instead, companies just calculate the ins and outs each filing period and remit the difference. I have no professional experience with Japanese VAT, though, so take that with a grain of salt. I'm just basing that assessment on the link you found. The only thing I was pointing out is that there are a number of ways to skin a cat. If the U. S. did adopt a VAT, it would likely be somewhat different than what either the Japanese or Canada / Europe has adopted (see English system of units vs. Metric). What is apparent is that under the Japanese system, there are no assets for VAT paid in a previous time period that are carried forward (unlike the Canada / European system). There is nothing to stop the U. S. from adopting a Canada / European style VAT and allow ITC's to be carried forward 10 years, 50 years, or even indefinitely. "A government could conceivably finance it's deficits or reduce it's outstanding debt obligations with the use of ITC's that are held by the public." John, great piece as always. Out of curiosity, what is your opinion of the FAIR Tax scheme, and why do you prefer a VAT, as a way to implement taxes on consumption, over the FAIR Tax? Fair tax is pretty close. As a sales tax it has much more incentive for avoidance. VAT is collected at every stage of production which is much more self-enforcing. The distinction between new and used, for example, is not a big deal. The fair tax proposal also fixes the rate and has a redistribution scheme, which I think should be separate questions. But overall, I'd be happy with Fair tax too. VAT would be greatly more complicated to administer than the Fairtax and complication adds cost which ALWAYS Fall on consumers. I greatly favor the Fairfax over a VAT. I really don't think a VAT has to be that much more complicated than the Fairtax. The difference to consumers is close to nil. Progressive VAT is equivalent to income+corporate tax. A 20% VAT would not be enough to raise the necessary revenue, because you have to make up for revenue losses caused by the compensation to less affluent people (i.e. your proposed $10,000 checks). Also, you would have to tax every transaction: doctor's visit, hospital treatment, bread, water, medications,..., absolutely everything. If you account for the (monthly) checks going back to people, the necessary VAT rate would be probably something like ~40-50%. This in turn would mean that a person making a minimum wage would pay a very low VAT and the top 1% would pay ~50% VAT. The net result would be the same: progressive taxes. However, a %50 VAT could discourage people from spending which would not be good. Interesting point. A true VAT (national sales tax) would not capture cash transactions. A VAT isn't a national sales tax. It is self-enforcing. So if it were transactions of cash for goods, then there is an incentive for the VAT to be paid. If it is cash for services, more challenging. What are your thoughts about Pigouvian taxes on negative externalities ? Very interesting thoughts...But I can't quite get my head around how this relates to the fact that people with lower income (currently) pay a much larger proportion of their income in VAT (see the link below). I really wonder where the progressivity would come in (as mentioned above). A high VAT invariably leads to increased tax evasion through bartering, cash deals and smuggling. People certainly try their best to avoid income tax today so in a sense it wouldn't be that much different, but for most people I think that a VAT would be easier to get around. A moderate VAT (say 5%) would raise a significant amount of revenue but not be so onerous as to encourage evasion. Either way it seems clear that the problem with the US government isn't the tax regime per se, it's the endless manipulation of the tax code by special interests. The part of the economy willing to deal in cash (and run the risk of prosecution) is pretty limited. My local Walmart will take cash but I am pretty sure they remit the tax and the same with the utility companies, car dealerships etc. The opportunities for bartering are pretty limited. Part of the argument for the GST was that even if home repair guys wanted to be paid in cash they would have to pay the tax on supplies (because Home Depot and Lowes are going to comply) and not be able to claim input credits. I wish there was more discussion on how redistribution is meant to help people. Reading Bill Easterly on foreign aid, Tom Sargent on European unemployment, and witnessing the harrowing opioid addiction and abuse of disability insurance...I can't help but think the current system of redistribution does anything but help poor people. You suggest that because the tax code's structure is far less controversial than the amount of tax collected, we ought to agree upon structure in isolation to avoid partisan gridlock. Unfortunately this logical hypothesis has already been tested, repeatedly in fact, and failed. The most recent major attempt was Camp/Baucus, but there have been many others. It's important to understand that you cannot "leave the rates blank" when drafting new tax policy. That'd be the rough equivalent of telling an architect to "create a blueprint for this new building, but leave the scale blank for now, because I still haven't decided how tall it will be." Bipartisan tax reform efforts generally try to solve for the problem above by making "revenue neutrality" the stated goal. But it turns out the parties vehemently disagree on what "revenue neutrality" means. So ultimately one type of partisan gridlock is substituted for another, and nothing happens. Believe me, I get the underlying temptation here: the tax code's structure is terribly inefficient, so fixing it should be easy! But sadly there's just no way around the battle over how much tax to collect, so it must be fought and won before serious reform can proceed. We know it's true because we can observe it: there are thousands of tax jurisdictions in the world, imposing different variations of tax. The unavoidable conclusion of any comparitive analysis is that wealth taxes suffer most from the impact of "special interests," followed by income taxes, followed by consumption taxes. The cause is less certain. My own experience in the tax world leads me to believe that the harder something is to define and measure, the more fertile ground it becomes for special interests. So in other words most people have their causation backwards when it comes to tax complexity: they think special interest groups create the complexity, whereas in reality it's the existing complexity that attracts those groups. Either way though, the cause doesn't really matter to John's point. It's enough that consumption taxes have proven less susceptible to special interests than other types of tax for his argument to hold up. I will invite you to look at the experience of VAT in developing economies, because my perception is the opposite. The complexities that you can introduce in a VAT system are uncountable. Whether it can be a less complex system than an income or wealth tax system, it is something I am not sure about it. Yes, a VAT can get derailed with attempts to subsidize groups, businesses, and activities. The moment of changing from income to VAT also provides a good almost constitutional moment to decide we want to precommit against that. If the VAT legislation says "this VAT shall apply an equal rate to all goods and services, and to all persons and institutions" right up front, it's a lot harder to ask for specials later. "I think that we need to address how these complexity arise and how interest groups get their way in the system." I don't think you need to look any further in the U. S. than 100 Senators and 535 House members. In any system of representative democracy, you are going to invite special interests garnering favor with elected representatives. That will happen with any form of taxation (VAT, income, etc.) or spending policy. The U. S. had the same problem with managing the U. S. monetary base prior to 1913. Finally, the U. S. Congress (with Democrats and Republicans on board) signed off on the Federal Reserve Act. The biggest point of contention leading up to the creation of the Fed was the degree to which the Fed was answerable to Congress versus an agent of the private banking system (or the "NY Money Trust" as it was called at the time). "If the VAT legislation says this VAT shall apply an equal rate to all goods and services, and to all persons and institutions right up front, it's a lot harder to ask for specials later." I don't see a power to "tax consumption" or assess a "value added tax" anywhere in this amendment. A VAT or consumption would be a type of excise tax, which is in the Constitution. "A VAT or consumption would be a type of excise tax, which is in the Constitution." Okay. As an excise tax, it would need to be uniform throughout the United States. "To lay and collect Taxes, Duties, Imposts and Excises, to pay the Debts and provide for the common defense and general Welfare of the United States; but all Duties, Imports and Excises shall be uniform throughout the United States"
Finally and most importantly - the power of the federal government to tax income is granted to it under the 16th Amendment. To ensure that the Federal Government could not assess both an income and VAT tax, the 16th Amendment would need to be repealed. "Zero is important. Eliminating the personal income, corporate income and estate taxes is important. Taxes are like zombies. If you just reduce the rates but leave the taxes in the code, they come back. And all the deductions, exclusions, credits and the rest come back too." I'm not sure I understand what you mean. Virtually all VAT taxes are uniform throughout their country. Why wouldn't they be? What is the legal definition (under Constitutional Law) of "Uniform"? "What about progressivity and redistribution? 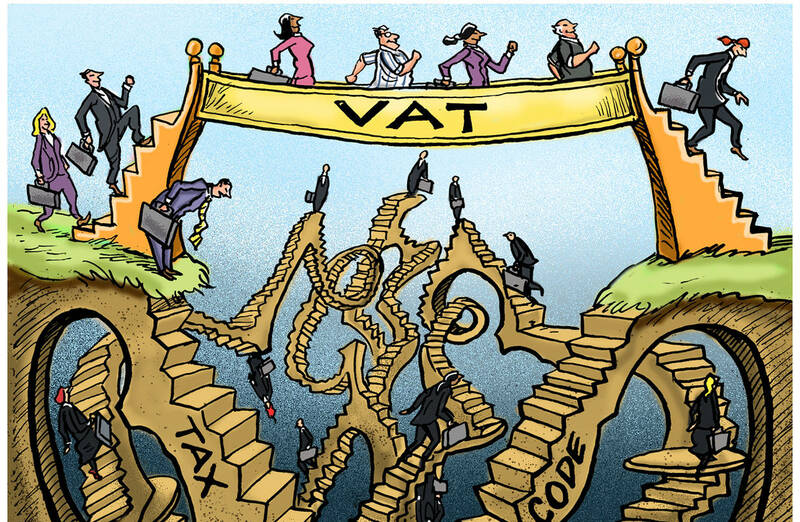 The oped explains briefly how to make a VAT progressive, if that's what you want." If a VAT tax is progressive, is it no longer uniform? Also, does a uniform VAT exclude the possibility of Congress changing the VAT rate over time? I don't know these answers, I have a pretty basic understanding of Constitutional Law. Frank, the Constitution says "uniform throughout the United States." So that means it must apply to all of the states equally. I don't think progressive features would obviously violate that particular clause. And you are correct, uniformity (per the majority opinion written by Justice White) is limited to geography. Though it should be noted that the particular case being decided did not involve a federal excise tax or tariff. Instead, it was a case over a New York State law that assessed a progressive tax rate on inherited property. Shareholders will pressure companies to retain all earnings rather than dividend anything so the money can compound tax free.? I want to see the top rate increased to 50%...? Abolish the SaLT deduction and limit mortgage deduction to houses worth less than $500,000...? It's a strong argument, but I think it's a bit reckless to assume a VAT will not introduce distortions of its own. Specifically, when you implicitly subsidize saving over consumption, economic actors will "over-save" relative to the base case. There is also the risk of a downward spiral of consumption and rising taxes to achieve a given federal revenue target. In other words, a given amount of revenue for the government can be achieve either with 1) an income tax, or 2) a consumption tax. The consumption tax need normally be higher than the income tax because income exceeds consumption when there is saving. As consumption falls, the government needs to raise the VAT to achieve its revenue target. This provides a relative subsidy to savings, further reducing consumption, requiring a VAT tax increase, ad infinitum. In a closed capitalistic economy, unless you are talking about stuffing cash in a mattress, for every saver there is a spender (and vice versa), so if someone is "over saving" by buying bonds / stocks then someone else is "over spending" by selling bonds / stocks. In an open capitalistic economy, there can be "over spending" or "over saving" by an individual country, but a VAT (in and of itself) does nothing to address this. "The consumption tax need normally be higher than the income tax because income exceeds consumption when there is saving." Nonsense. Presuming that the government spends (consumes) whatever tax revenue comes in, all that has happened is that the consumption choice has shifted from the individual / company to the government. That is the big lie of consumption / VAT taxes - that they curtail total (private and government) consumption. I think what you mean to say is that - "As PRIVATE consumption falls, the government needs to raise the VAT to INCREASE IT'S LEVEL OF CONSUMPTION TO MATCH THE FALL IN PRIVATE CONSUMPTION." Is there any reputable work that might relate tax structure to the business cycle, especially recoveries? I feel like in a new monetarist style chain economy a VAT has the potential to gum up the works through temporarily taxing intermediate suppliers all of whom have to stay solvent. I think you see the same thing that I do - a VAT can cause taxes paid to be a significant upfront cost for the producers of intermediate / finished goods rather than a cost spread over time (like an income tax). Finished good producers pay full taxes before a single good is sold by them - hence those taxes represent a potentially significant upfront cost. As a matter of record keeping they have a negative tax liability going forward that is recovered when they sell those finished goods. During an economic downturn, those finished good producers may end up with inventories of unsold goods (assets) as well as an inventory of unrealized negative tax liability (assets). How should those unrealized negative VAT tax liabilities be treated in terms of evaluating the solvency of the company? Also, how should negative VAT tax liabilities be treated when the VAT rate is changed in relation to the business cycle? Is a negative $7,000 VAT tax liability at a 7% VAT rate still worth $7,000 when the VAT rate is reduced to 5%? Matching VAT refunds to the corresponding sale is not a typical feature of the tax type. Not in Canadian GST and not in EU-style VAT. In both systems, a business files for a VAT credit when the VAT is invoiced, and not when the corresponding product is sold. Since the VAT refund is based upon what is actually paid, a change in rate is not a complication to the credit. See below for differences in the invoice based method (Canada / EU) versus the accounts based method (Japan) in calculating a VAT. Notice that Canada and the EU aren't the only economies that have implemented a VAT. Notice also that John C. does not stipulate the type of VAT that he prefers. "There are two main methods of calculating VAT: the credit-invoice or invoice-based method, and the subtraction or accounts-based method. Using the credit-invoice method, sales transactions are taxed, with the customer informed of the VAT on the transaction, and businesses may receive a credit for VAT paid on input materials and services. The credit-invoice method is the most widely employed method, used by all national VATs except for Japan. Using the subtraction method, at the end of a reporting period, a business calculates the value of all taxable sales then subtracts the sum of all taxable purchases and the VAT rate is applied to the difference. The subtraction method VAT is currently only used by Japan, although subtraction method VATs, often using the name flat tax, have been part of many recent tax reform proposals by US politicians." Frank, I'm not familiar with Japan's system in my professional capacity, but it sounds nothing like the matching system you seemed to be proposing above. As I said, this problem of upfront expenditures with no payoffs is not a feature of VAT taxes. My only point is that a U. S. VAT may not precisely match what is done in Europe, Canada, or Japan. The U. S. could conceivably require companies to hold onto ITC's until they can be deducted against their VAT receipts on future sales. Again, John doesn't indicate how a VAT should be implemented in the U. S.
Frank, it's true that we have no single plan we can imagine. However, I don't think it's reasonable to object to a VAT as a category by imagining that it might have traits that would make it a uniquely horrible VAT in the entire world. That's discuss what's more likely to happen until we have something more concrete. I was thinking in terms of making the VAT better (not worse). I think that longer duration (5, 10, 30) year ITC's make a lot of sense from a government finance perspective. I think that trying to introduce progressiveness into a VAT is a mistake. "OPTIMAL FISCAL POLICY IN A BUSINESS CYCLE MODEL"
I was thinking about the actual implementation details. Your original article refers to government-provided debit cards like India. However, prepaid debit cards with reasonable fees already exist ($12 per year for an American Express one). These also rarely have hidden fees, which are a good option for the poor. One complication is how this combines with progressivity. In a progressive system, you have to take into account all the cards of a household. For instance, you shouldn't be able to put a card under your kid's name and put 10,000 worth of purchases on that card to get a full rebate on the tax. It need not be government provided. Private debit cards can simply report to the IRS electronically, and the IRS approve the rebates. I 100% get that. The problem is that you have to rely, to some degree, on people being clear about who owns the debit cards and what their filing status is. For instance, suppose I am a single parent with a child, under the current system, I have an incentive to report him to receive a tax deduction. Now, suppose that we adopt the suggested system you recommend. I now have an incentive to take out a debit card in his name and spend 10,000. In other words, if you aren't keeping track of family units, then every additional child has this tax benefit. The big thing missing from this post is utility. Utiltiy is key here because when we want minimal "economic cost" of taxes, we really want minimal "happiness cost". Let that sink in. The point of economic policy isn't to maximize dollars, it's to maximize happiness. We know this because people vote on what makes them happy, not on what makes them wealthy. We should tax the dollars least cared about. On that note, why not push for a wealth tax? Doing the math shows that a federal 3% wealth tax could replace all other forms of federal income. And, if you do your personal math, you'll realize that just about everyone but the most wealthy pay much more in income taxes every year than 3% of their wealth. So, a flat-wealth tax would be much more progressive in terms of utility than even a very progressive VAT or income tax. Please explain the affects a VAT Tax would have on money that has already been taxed, i.e. Taxable accounts and Roth IRA's. Perhaps the solution would be for the U.S. to deposit the VAT tax percentage (ex. 20%) into citizens taxable and Roth accounts based on balances held the night prior to implementation of the VAT! Just look at all these comments and issues. This VAT - at least the way it's being conceived here - is starting to sound just as complicated as the current income tax. Why not just go with a sales tax with exclusions for food, medical care, and reasonable housing costs? That should actually be plenty progressive. If you really feel the need to redistribute wealth then just write people a check. That should not be the goal of taxation. "Why not just go with a sales tax with exclusions for food, medical care, and reasonable housing costs? That should actually be plenty progressive." And it would also mean that the sales (excise) tax is no longer uniform. See Geech's comment above. "throughout the United States" seems like a geographic statement. Gary, any tax is going to seem complex when you get into the nuts and bolts of it. However, in my personal experience a VAT is less complex for businesses than current sales or income tax in the United States. I think the experience for consumers would be very similar to a sales tax. To be fair, I don't think sales and income taxes in the US need to be as complicated as they are currently, so there may be room in the tax reform discussion to improve those rather than switching to a VAT. How about net worth tax, every year? That would be pretty non-distorting! The rate would be minimal and redistributional effect is just right (or should I say left?). I would throw in a distorting balance sheet size tax to discourage leverage though. I'm sure everybody loves this idea! The goal of a tax should be to generate revenue for the state, not to redistribute wealth. And eventually wealth moves to where it's most welcome. Online Asset Pricing is back!